This one is also tasty anytime of year. Beat eggs and add cotage cheese, and spices. Dampen matzah pieces with water. Don't let them get soggy. Put a small amount of sauce on the bottom of an eight inch square pan. Layer matzah, cottage cheese, sauce and cheese three times. Bake at 350 for 45 minutes. Cool for 10 minutes, then cut to serve. Surprisingly there is no taste difference between this, and using pasta. It tastes lighter though. That's such a great idea. I can't wait to make this for my boyfriend... he's been matzah crazy this week. What a concept -- and me not able to find matzo when I went shopping last weekend (have been making do with tortillas...). Am definitely going to try this once I've tracked some down! That looks delish! I might try this for dinner on Saturday night (i.e. the weekend, when I have time to cook). Thanks for sharing! This looks like a nice alternative meal. 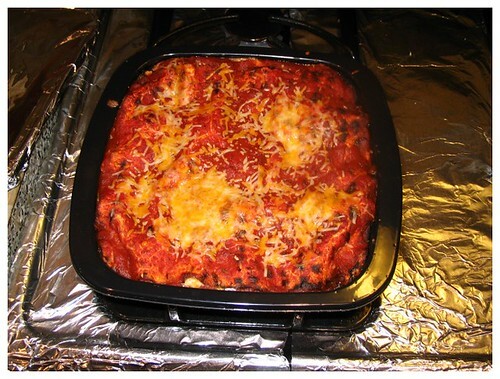 My family loves this lasagna alternative. My Dad is a huge pasta fan, but this one makes him equally happy. omg- we got matzah with sundried tomato in it this yr and this is the perfect way to use up the end! thanks! That looks delish- what a clever idea! I bet the sundried tomato matzah is great. I will have to check out the Kosher section next time I go grocery shopping! ;Dtestimony- this is yummy! i made it tonight and it was very good! thanks for the recipe!